中央供料系统正是在这种市场需求的背景下发展成熟起来的Central feeding system for the central development of the system for the development of the system is bound to block, the central feeding system is a continuous environmental protection of the central suction system, which is more than the country to launch a central system for the system. 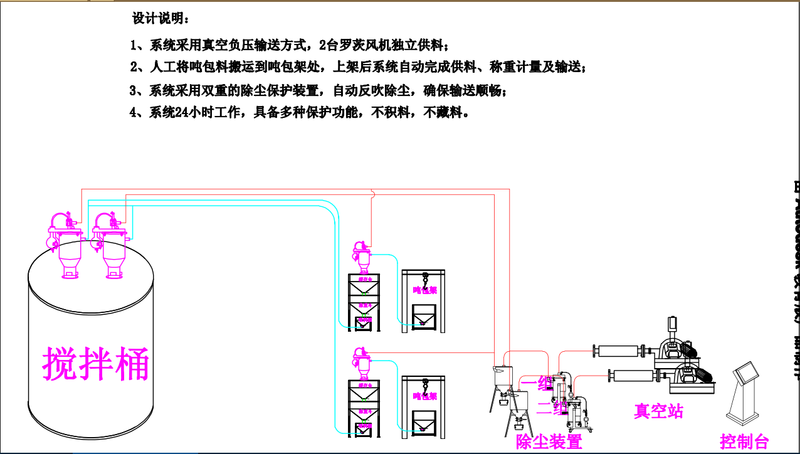 Suction system Introduction: Central feeding system refers to all the cyclone separator (or raw material receiving equipment) and vacuum pump and control system through the pipeline and circuit connected. The central feed system consists of a vacuum pump, a raw material drum, a feeder with a vacuum shut-off valve, a molding machine, a raw material line and a vacuum line (some systems also include a central floor dust collector), and a smart control card control system. Central feeding system has the following characteristics: efficient raw materials, dry, color, crushing and recycling materials to achieve a high degree of automation and control, and can meet the 24-hour non-stop production needs. The fuel supply system is simple to save energy, reduce the amount of labor, reduce the cost of raw materials and auxiliary equipment to provide more space, the application of central processing and reduce the cost of individual equipment to save energy and maintenance costs; personalized according to different users, workshops, raw materials designed to optimize Program; modern factory image to raw materials and dust on the injection molding production area to minimize pollution, and reduce noise, to achieve unmanned automated production. The central feeding system has the following characteristics: efficient drying of raw materials, color, crushing and recycling materials to achieve a high degree of automation control and monitoring, and can meet the 24-hour non-stop production needs. The fuel supply system is simple to save energy, reduce the amount of labor, reduce the cost of raw materials and auxiliary equipment to provide more space, the application of central processing and reduce the cost of individual equipment to save energy and maintenance costs; personalized according to different users, workshops, raw materials designed to optimize Program; modern factory image to raw materials and dust on the injection molding production area to minimize pollution, and reduce noise, to achieve unmanned automated production. What is the effect of the central supply system?